Picking out nursery furniture for your new baby room is so exciting! There are so many gorgeous nursery designs to choose from! What about shopping at the online baby furniture stores with a muffin and a nice cup of tea? Now that's a much better idea! Only problem is where to start. You can really get lost among all the baby stores on the internet - there are ka-zillions of them out there! Some of them will hold wonderful surprises and welcome discounts and sales while some will only try to pull the wool over your eyes - how will you know the difference? To write this page I have researched and pulled together all the best online baby stores, broken down all the different types of nursery furniture you may be shopping for, from modern to eco, iron crib to round and then I've highlighted the best stores in each category. All the stores on this page are top-notch in terms of service and quality. Just scroll down to the type of furniture you are looking for and click on the links to visit my top recommended stores. As always, if the word discount is making your wallet wriggle around with giggles of glee Amazon.com's baby department swoops in to the rescue. Sure it's not glamorous or hip, but the baby furniture at Amazon is practical and attractive and let's face it, it's the same stuff stocked by 90% of the other baby stores - just at lower prices! No one will ever know you bought your baby stuff at Amazon, and your baby certainly won't care what she's drooling all over, so why not give your wallet a welcome break and check them out? For the biggest selection of basic baby cribs, armoires, dressers, changing tables, gliders, and virtually anything else you may want for your nursery room, you really can't beat csnbaby.com. They have an absolutely massive range at reasonable prices - you really can't go wrong buying your baby furniture here. Look out for their regular promotions - at the time of writing they have 20% off any stroller! If you are planning a modern baby nursery, allmodernbaby.com is an absolute must-visit. They have a stunning collection of all the snazziest contemporary brands. Do Oeuf, Argington and NettoCollection sound familiar? If you can't find something appealing there then hop over to modernnursery.com for an equally gorgeous collection including everything from green cribs to orange gliders! Many moms to be are becoming more conscious of how the chemicals surrounding their babies can affect their health. For this reason a few of the leading baby stores have opened a green or eco section in their stores. Babyearth.com is a forerunner in the green baby stuff movement and prides themselves on being able to offer the earth conscious mama a very comprehensive range of eco products covering everything from baby cribs to maternity wear. If you are looking for stylish eco-friendly furniture this is THE place to visit! If budget is no concern and designer is what you are after then I have the perfect place for you: PoshTots.com. Everything on their site is just brimming over with decadence and luxury. You will fall in love instantly with the divine baby stuff they have to offer! Be warned though - this site is definitely not intended for the cash strapped parent! If Poshtots is a little out of your league (and let's face it that would apply to most of us!) but you still want designer, then you should visit Dimplesanddandelions.com - one of the true gems among the online baby furniture stores. This beautiful boutique baby store has trendy and chic down pat but with slightly less of an impact on your wallet! Fun and whimsical baby nursery furniture can add just the right finishing touch to your baby room theme. aBaby.com is the online baby furniture store that has this aspect of nursery decorating absolutely wrapped! From butterflies and ballerinas to castles and spaceships they have it covered in the most adorable way! Just choose your nursery theme and then click on the crib or furniture sections - you'll be swept away! 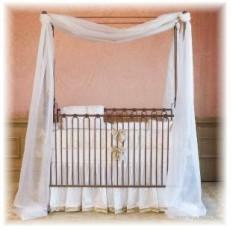 Iron cribs are the way to go if you are looking for a touch of elegance in your little one's hideaway. These gorgeous creations are made by Corsican Furniture and Bratt Decor and they are simply breathtaking. There are many baby stores that carry the odd one or two in their crib collections, but for sheer variety and availability aBaby.com wins hands down! They have 25 different models available, all in a variety of stunning finishes. So if glamour is what you are after - look no further! Round cribs make a statement - no doubt about that! Browse the round crib selections at the following stores to make up your own mind! 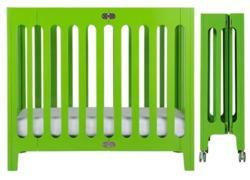 csnbaby.com has the best range of Stokke round cribs. The prices are the best you'll find and they offer free shipping! Enjoy shopping at these best of the best online baby furniture stores - and remember to check out their top-notch nursery decor while you're there. You won't be disappointed!